Colleen Marie Davy (Boxall) - Edmonton's Burial & Cremation Professionals | Trinity Funeral Home Ltd.
Colleen is survived by her son Corey and Karen, son Dan and two grandchildren, sister Jan, brother John, brother in law Dave, many nieces, nephews, grandnieces, nephews and amazing friends. Colleen was predeased by her husband Brian, two sisters Carol and Yvonne. Colleen was born December 5, 1946 in Prince Rupert B.C. She grew up in Winnipeg, MB raised by her parents Carmel and John Boxall. Colleen married Brian Davy and had a busy, fun marriage, traveling to Hawaii and Barbados for Brian’s work. Later settling back to Vancouver, B.C. with Brian she worked for Canada Bread. 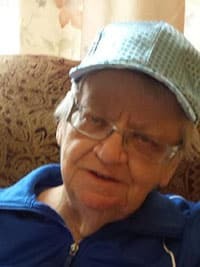 Upon retirement Colleen moved to Edmonton where she had family and hoped to have professional career in Bingo, reading and decorating her home. Colleen will always fill our hearts with her humor, smile and awesome dinner parties. Donations can be made for to any Cancer Agency or Alzheimer’s Society. If you have a story or memory please share. I’m a companion with a lady in Miller Crossing. I had no idea that Colleen passed until February this year. You might find this eerie but Colleen continued walking the halls at Miller because we have seen and spoken to one other. It was three weeks after our last encounter in February 2019 when I was told by staff she passed a long time ago. I’ve since then prayed for Colleen to go to heaven and not be confused any longer. Auntie Colleen, you have wanted to go home for a long time now, only you really weren’t sure where home was anymore. I’m so glad that you are finally getting your wish – home with Brian again, home where your mind is clear again, home with loved ones all around you. We all are saddened by Colleen’s passing but we can’t forget all of my older sisters influence on those who knew them as they grew into the women they were. If you can’t smile at Colleen’s generosity and joy of life, you missed something. We have to thank our niece, Niki Constantin and family for the support, patience and love for Colleen in her later days. I choose to remember the great times and generosity that Colleen, Brian and Corey have given Susan and me. Always keep a diamond in your mind. Love u Colleen u will be missed.